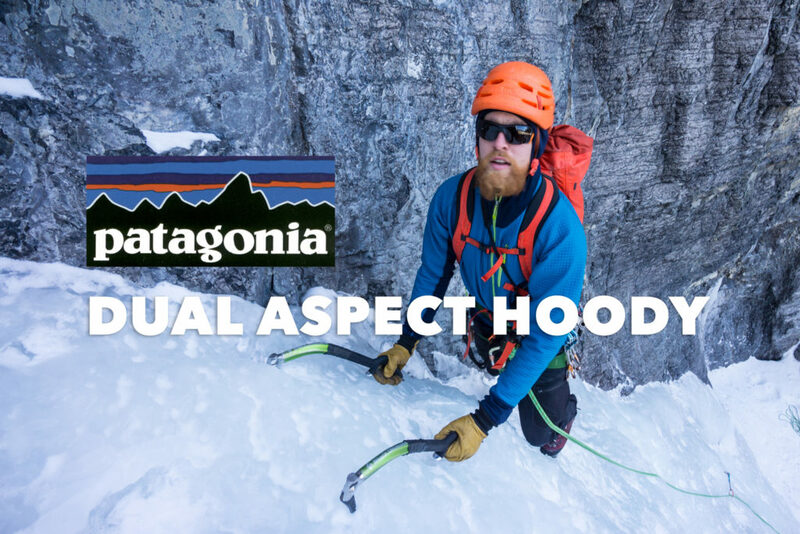 The Patagonia Dual Aspect Hoody is a versatile layer that can be used as a mid layer and shell layer, given the right conditions. By using a hybrid construction, Patagonia is able to use the most suitable fabrics in the right location. The jacket also blurs the lines between softshell and mid-layer by functioning equally well as either. The jacket cuts the wind on the approach exceptionally well while staying breathable. The Dual Aspect hoody is one of the few jackets I can put on at the tent or parking lot and keep on for the rest of the day. By using a wind and water resistant fabric throughout the core of the jacket, it kept me comfortable during light to moderate winds while approaching. As long as there isn’t any heavy snow or sleet, the jacket is very comfortable. Since the jacket also functioned as a mid layer, it provided additional insulation underneath a shell jacket. This prevents having to take the layer off when the weather takes a turn for the worse, allowing you to layer your shell right over top. The fabric choices is truly where this jacket stands out. Underneath the arms, the hem and the sleeve ends, Polartec Power Dry is used. This mid-weight fleece has an excellent weight-to-warmth ratio and is used in the Patagonia Piton Hybrid jacket and hoody. While the Piton hoody is an excellent mid-layer, I often find it too warm for approaches and more technical climbing. The Dual Aspect is an excellent improvement on the Piton hoody in this respect. Similarly to the Arc’teryx Acto MX (reviewed by The Alpine Start here), the Dual Aspect hoody also functions excellently as a mid layer. I was not impressed with the Acto fabric as much as The Alpine Start reviewer was. Though incredibly breathable while moving, I found the Acto fabric lost heat very quickly while stopped. The Dual Aspect hoody, with the warmer Power Dry fleece in select areas, is able to retain heat better when stopped. Used in the core and shoulders of the jacket is Polartec Power Shield fabric, the more breathable cousin to Power Shield Pro (used in Patagonia’s cult-classic Knifeblade series of alpine clothing). While still using a membrane to provide water and wind resistance, the Dual Aspect is incredibly breathable. Likely in no small part, this is due to Patagonia’s exclusive fabric combination of Power Shield fabric laminated to a Power Grid knit backing. Power Grid is the identical fabric used in Patagonia’s famous R1 series and it serves its purpose by providing additional wicking power to the fabric. This is very notable and the fabric overall is much more breathable than Power Shield Pro jackets I’ve used. The Power Grid fabric’s additional insulation is just right and compliments the Power Dry fleece well. Another big positive (for me) is Patagonia’s “slim fit”. The jacket fits long in the torso (even for myself at 194cm tall), with long arms and a snug fitting, R1 style hood. The hard-faced Power Shield fabric extends down the core far enough to accommodate the harness. This will undoubtedly extend the lifetime of the jacket, as the Power Shield fabric is much more durable. The single chest pocket compliments the two hand pockets. Given the niche market for this jacket, I would have been happier with two chest pockets. As expected, the hand pockets become useless once wearing a harness or backpack with hip belt. Luckily, the zippers used are low profile and use a very fine gauge, which Patagonia calls Slim Zips. This means they are not only light but also unobtrusive. The hood is constructed of Power Dry fleece and fits snugly. An extension of the soft shell fabric to the hood would have improved the jacket’s performance in foul weather. While the fleece hood is significantly warmer than the R1’s, I found it a comfortable weight for winter climbing. There are no adjustments to the hood or in the hem or cuffs. Additional adjustments in those areas would have further increased the versatility of the jacket. The jacket has been my go-to for the past few months of ice and mixed climbing. Incidentally, on the first day of use I decided to tackle a rarely climbed overhanging chimney near Field, B.C. Halfway up the pitch, the abrasion on the jacket briefly came to mind, but I had other worries at the time! Having done some more chimneying and mixed climbing since, the back and shoulders show little wear. Some of the stitching of the fleece fabric has started to show some light fuzzing, but no serious damage. As good on the approach as it is while climbing, the Dual Aspect hoody means my shell stays in my pack for longer. This keeps me more comfortable throughout the day.